Retrospectives are a critical tool for the Scrum Master. How we use them, how we treat the information from them is critical for our success. In this episode we explore how we can approach retrospectives from our Scrum Master’s role point of view. The Hot Air Balloon is one of the many metaphor-focused retrospective formats. These formats help the teams talk about the real problems without the pressure of being exact or literal in their descriptions. “It felt as if we had too much ballast”, can be the conversation starter that leads to finding previously undiscussed (and undiscussable?) blockers for the team. 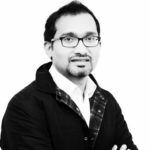 With a firm focus on Agile and Scrum methodologies, Zeshan has worked within high profile organisations, including the HSBC, Capgemini Financial Services, Talk, Talk, and many more. Having worked with Agile companies for many years, Zeshan identified a need for a community of Agilists in Pakistan, which would bring together professionals adopting an Agile or Scrum approach, help increase awareness of Agile. You can link with Zeshan Ilyas on LinkedIn and connect with Zeshan Ilyas on Twitter.